The rise of the freemium model has made free iPad games a lot more popular, and while some freemium games are nothing more than annoying attempts to bleed your wallet, the best offer in-app purchases that add to gameplay without becoming a requirement, thus allowing you to pay or not pay as you please. And between ad-supported gaming and freemium games, there are a lot of great free games you can download from the iPad app store. This list avoids free games with the over-the-top freemium models, so while a game like Dungeon Hunter IV offers great graphics and good gameplay, it doesn't make the list based on its annoying in-app purchase mechanics. Temple Run was made popular when pop sensation Justin Bieber and Houston Texans running back Arian Foster became addicted to it. And it's quite easy to become addicted to this one. The premise is simple: keep running else the demonic monkeys will eat you. Turning left and right, jumping over chasms and rings of fire, and sliding under trees all the while collecting coins and unlocking powerups — yeah, it's crazy. Crazy fun. Think of it like a 3D version of Pitfall. With monkeys. Hearthstone is the perfect example of the freemium model done the right way. This addicting card battle game allows you to buy card packs (and, now, an expansion), but never really pushes you to buy it. In fact, you can buy card packs for gold you earn doing quests in the game and even buy access to the expansion without paying a dime. And the best part is this fun game is among the best card battle games on the iPad. Everyone's favorite minions cast as the lead characters in an endless runner? Sign me up. This fun game adds a few twists on the endless runner mechanics, but mainly, it's fun because of the minions. A nice combination of humor and gameplay will quickly get you addicted to this title. From the old to the new, Draw Something Free is one of the more recent viral games infecting our devices. Draw Something Free is a digital version of Pictionary and a quite addicting one at that. The game allows you to play with friends or grab a random opponent and has the same turn-based gameplay that makes Words With Friends so easy to play. This one could almost be called an oldie-but-a-goodie if it weren't for the fact that Words With Friends is only three years old. Available on just about every platform known to mankind, including the ever-popular Facebook, Words With Friends is a Scrabble clone that allows you go play the word game in a turn-based format, even playing several games simultaneously with different people. Candy Crush Saga leverages the fun of a matching game with deliciously satisfying explosions. The game starts out simple enough at the beginning, but the puzzles offered by pesky insects and blocked areas get more difficult as you progress through the game. This one is great for both kids and adults. One of the top strategy games on the iPad, Plants vs Zombies 2 is a great sequel to the original. It may not have as many different game modes, but it provides a solid experience. Anyone who loves tower defense games should check this one out. It does get more difficult not to spend money on it, but there is plenty of free content to make it a worthwhile download. If it seems like this list is heavy with endless runner games, it's for good reason. The genre seems to lend itself to the freemium model without being too annoying. It helps that Temple Run both popularized the genre and set the template for how to monetize it. Sonic Dash isn't going to win any awards for reinventing the endless runner, but for those who loved Sonic back in the day, this is a nice blast from the past. Perhaps one of the most beautiful games on this list, Asphalt 8: Airborn also offers the most annoying free-to-play mechanics of any other game on this list. It also happens to be one of the best racing games on the iPad, which is why it is included. Asphalt 8: Airborn adds air stunts to the game, and performing them can give you a boost of nitro. But performing tricks slows you down, so you will need to decide whether a trick is worth it. If you love World of Warcraft, you will want to download Pocket Legends. 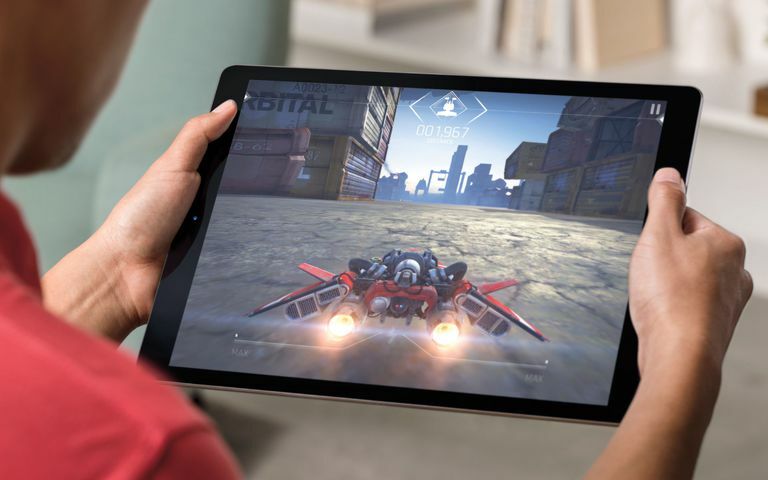 This MMORPG for the iPad offers three different classes and the ability to access your characters from your iPad or your iPhone, so you'll be able to play wherever you are and whichever device you take with you. The game includes quests, crafting, PvP and everything you expect from an MMO. If you like physics-based puzzle games, Bubble Ball presents a nice challenge. The object of the game is to guide the bubble to the finish line by placing wood and metal pieces on the screen in order to guide it. A great game, Bubble Ball garnered a certain amount of fame based on its 14-year-old developer and pushing Angry Birds out of the top spot for a time. If you love gem-based games or matching games, Bejeweled Blitz is top notch. A freemium game that doesn't push the store in your way, there are plenty of different options and bonuses to keep you going on this one. You can even buy your own powerups to use within the game and shake up the board, explore special gems or simply start with bonus gems. Bejeweled Blitz is easily one of the best free games on the iPad. Think you can Sudoku better than your friends? This OpenFeint-compatible version of the classic puzzle game will let you access leaderboards and compete against your friends. The game comes with thousands of free puzzles and divides the boards into three difficulty levels, with harder difficulties unlocking after you beat your current difficulty setting twice in a row. Mega Run is like a cross between Temple Run and Mario Bros. You control Redford in this fast platformer that challenges you to collect coins and power-ups while avoiding chasms, obstacles, and various enemies. This nicely-designed game is parceled out in bite-sized pieces as you are challenged with higher and higher difficulty as you pass through the various stages and levels. Definitely a must-have download if you love platform games. After all of the technology packed into the iPad, is it odd to say that tossing paper is one of the most fun things you can do with it? Paper Toss may not be the best game to keep you occupied for hours at a time, but if you are looking to waste five-to-ten minutes in a waiting room or before your favorite show comes on TV, Paper Toss HD is your best friend. It's weirdly addicting how much just beating your previous high score will keep you glued to the game. Are you ready for some crazy flipper action? Zen Pinball presents a pretty good pinball experience, even going one further and allowing you to go into the depths of the pinball table for special areas. Zen Pinball isn't totally free. You'll need to pay $0.99 to $1.99 for additional tables, which include a series of Marvel-themed tables, but you do get Sorcerer's Lair for free. And the Sorcerer's Lair isn't a watered-down table. It's pretty fun.